The Lillen Collection of ready-to-wear bridal and evening fashion was launched just a couple of years ago in Vancouver, by a pair of women who put their heart and soul into each of their designs. We have been hearing nothing but enthusiast comments about their work, so we 've decided to take a closer look. If you're still looking for your perfect wedding dress, we think you should take a closer look too! Every year, the designers (Elena and Liliya) create two collections: Spring/Summer and Fall/Winter. Each collection is comprised of a total of 10-14 dresses: 5-6 bridal gowns, 2-3 evening gowns (for mother of the bride/groom) and 5-6 cocktail dresses (for bridesmaids). For Fall 2010, the collection includes this gorgeous Rafaela strapless gown (#551). This dress features French Chantilly lace and a corset bodice embellished with sparkling Swarovski crystals and freshwater pearls. The circle floor skirt is highlighted with laser-cut flowers. To maintain their high quality standards and luxurious appeal, Lillen only uses silk fabrics as silk organza, duppioni, chiffon, duchesse satin and taffeta. Their gowns are all about the details with laser-cut fabric flowers, handmade appliqués, freshwater pearls and Swarovski crystal embellishments. 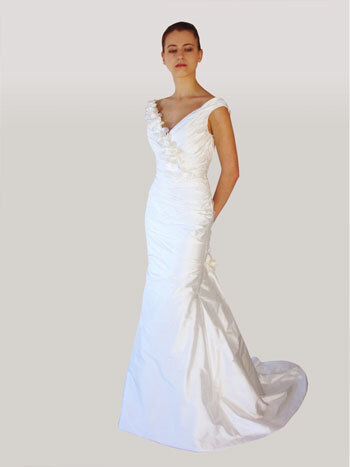 For a completely different look, the Sasha off-shoulder gown (#558) is a beautiful choice. Created from silk dupioni, this dress features an asymmetrically draped bodice and floral accents. Also from the Fall 2010 collection, the Michaela v-neck gown (#554) is a sophisticated option. This wedding dress features laser-cut flower details, a deep V-back and chapel train. 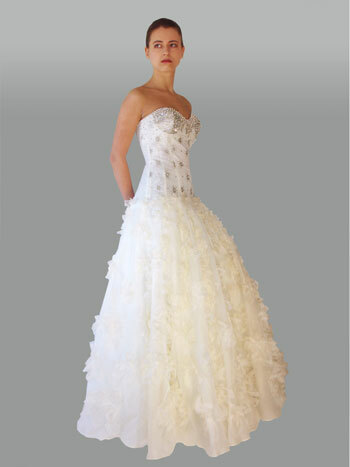 At Lillen, they are also willing to customize almost any dress to please the bride. For example, they can lower the back, add more flowers, make a longer train or convert a strapless gown to off-the-shoulder. Lillen offers more than 200 colors of silk fabric and have had customers order everything from a light purple wedding dress to a China red bridal gown. Oftentimes a wedding dress just needs one eye-catching detail to make it memorable. With the Roxana gown (#553), it's definitely the neckline. 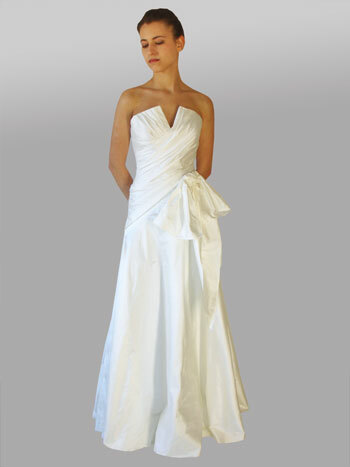 This silk dupioni dress offers a unique split neckline and gorgeous draping. This dress would be suitable for any type of wedding from the church to an outdoor affair. Sometimes simple is better. The Ramona gown (#555) isn't flashy but it's definitely beautiful. 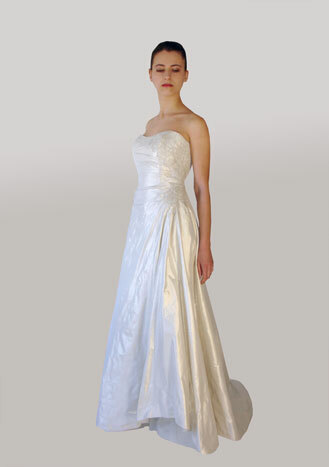 This strapless dress is created from Italian poly taffeta with French lace accents. Bridesmaids / Cocktail dresses too! If you are looking for short dresses for your bridesmaids, consider the Riana strapless cocktail dress (#562). 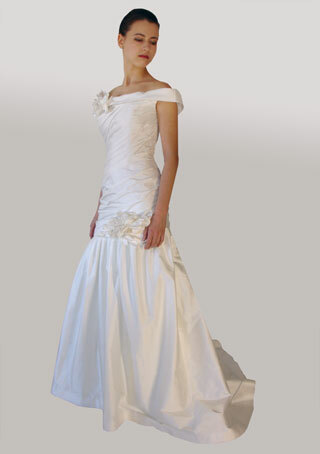 This beautiful piece features a ruched bodice with flower and ruffle accents. This dress is one that your bridesmaids will be proud to wear long after your wedding day. These are a few representative designs in the current Lillen collection. To see the rest of the line, visit lillencollection.com. Liliya was involved in fashion from very young age as she started designing clothes for herself and her younger sister when she was graduating elementary school. She was taught how to sew by her grandmother, who had her own tailor shop. Through helping her grandma, Liliya learned about fabrics, how to create a perfect fit and the importance of customer satisfaction. Her formal training included five years in the Academy of Art, four years at a fashion college and a course in couture draping, which helped her to develop a good sense of proportion and color. Shortly after moving to Vancouver in 1997, Liliya started to work in the fashion industry. She has international experience working in Ukraine, Israel, Canada and the United States, with customers such as Saks Fifth Avenue, Nordstrom, Barney's New York and many more. Elena grew up between the sewing machines, podiums and fit meetings. Her mother was designer at House of Fashion in Tallinn, Estonia and Elena, from age five, was a fit model for children's clothes. During high school, she had a part time job helping her mother choosing fabrics, cutting, fitting and preparing for fashion shows. Elena had no doubt about her future education and career. She has a Master's degree from St. Petersburg State University of Technology and Design, specializing in engineering in the garment industry, and international experience working in Estonia, Finland, Israel, China, Canada and the United States. Luckily for the rest of us, the two met each other in Canada in 2006. Elena had just graduated "Success" business school and was very impressed by Liliya's portfolio from fashion design and couture draping college. Both of them were passionate about having own business and creating their own collection. In September 2007, they took a trip to New York to meet the fashion world in search for fabric suppliers. In 2008, Elena and Liliya launched their own company by founding the Lillen label and presenting their first collection: Spring 2009. The collection was a huge hit and was picked up immediately and exclussively by Bisou Bridal, arguably one of the 2-3 most prestigious and upscale bridal boutiques in Vancouver.